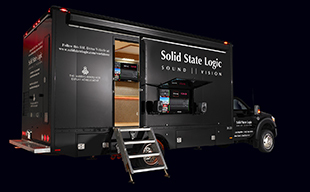 Heilbronn, GERMANY Solid State Logic are proud to announce Audio Pro as their new professional console distributor in Germany. The team have a prolific record of providing high-end audio solutions and support for live and installed audio systems. As part of the announcement, Audio Pro will be showcasing the new L550 and L100 live consoles at Prolight + Sound 2019 at the Vintage Concert Audio Show at Forum 0. “SSL and Audio Pro Elektroakustik worked together for a significant time in the 1990s and it feels good to be coming back together” comments Jim Motley, SSL SVP of sales. “We are more than confident that the team will be fantastic ambassadors for our brand in the Live and Installed markets with our System T, Network I/O and Live consoles”. With a pedigree in representing pro audio brands, the inclusion of SSL was an easy decision for Audio Pro’s Product Manager, Joerg ter Veer. “The SSL Live series is a perfect addition to the top end of our current product line up for the demanding German live market. Add in flexible DANTE based networking solutions and the System T production system, then we have the most powerful live and install platforms in the market”. Having a manufacturer partner they can rely on, also drove the decision. “SSL also has a similar understanding of customer service and support. That made Solid State Logic a perfect fit” Joerg adds. If you are attending Pro Light + Sound 2019 and would like to discuss this or any other SSL project, please contact Ross Gilbert (RossG@SolidStateLogic.com) to arrange an appointment.